VMware offers a free version of their vSphere Hypervisor with some limitations like the lack of vCenter support. Another limitation is that APIs are read-only, so it's not possible to use the Data Protection API aka. VADP to make Backups. Creating backups of Virtual Machines is also important on standalone ESXi hosts. The API limitation makes it impossible to create incremental CBT aided backups, but it's not impossible to create full copies of virtual machines. The post explains the technique to create backups and takes a look at solution that use these techniques. "cp: can't open 'web01-flat.vmdk': Device or resource busy"
The challenge is to make the disk readonly while the Virtual Machine is running, without affecting the operating system running in the Virtual Machine. Here comes another technology in place: Snapshots. A snapshot is a preserved state of the virtual machine where you can return to later. A common misinterpretation is that when you create a snapshot the system copies the defined state to another location. This is not how a VMware snapshot works. When you create a snapshot, the original virtual disk file is transformed into readonly mode. To allow the virtual machine to work while the disk is in read only mode, all write IOs are stored in another file known as "Delta File". Copy VM configuration files (.vmx, .nvram, .vmsd, .vmdk). The ".vmdk" is only the virtual disk descriptor file, so it's possible to make a copy. The actual disk is *-flat.vmdk. I'm copying all files to a nfs share mounted as datastore. The reason why I copy configuration files prior to make the snapshot is because the snapshot is documented in the configuration file and the Virtual Machine will not power on when the snapshot file is missing. This can be fixed in the configuration, but it's easier to simply copy the correct configuration. Restore: To restore the Virtual Machine register it on the ESXi Host "Add to inventory" and power it on. The Virtual Machine notices that it has been moved. If you want to restore the original VM, select "I Moved It" and it will preserve its UUID and MAC addresses. 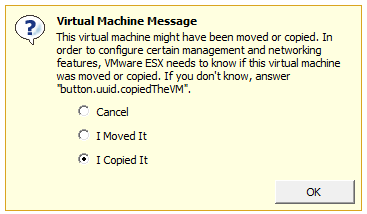 If you want to run both VMs on the same ESXi host, select "I Copied It", and you can run both at the same time. The scipt is very basic, without error checking and static. It's intended to demonstrate the process. ghettoVCB is a long known backup solution that works from ESXi 3.5 until ESXi 6, created by VMware employee William Lam. It's a comprehensive script that runs on the ESXi host and creates backups using the method explained above. It does not use the VMware backup API, so it works with free ESXi. This will create a backup of all Virtual Machines running on the ESXi host to the backup directory. To restore, you can simply add the .vmx file to the ESXi inventroy. + Good documentation. Easy to make cronjobs that are persistent through a reboot. The full documentation is available here. HPE VM Explorer is available as free edition here. The windows based software is configured and managed with a web interface and works with the free ESXi. If you want to create a backup of your standalone ESXi ot your Windows machine, this is your tool of choise. Of course it also supports backups to the local ESXi host. vMotion Fails - "The source detected that the destination failed to resume"
There should be copy of "flat" file ( point 4 first method ) not delta file - which is in use at that moment. For ESXi 5.5+ you can use Extrasphere solution. They supports free ESXi and have a free HotClone and very cheap HotMirror features. The last one a bit like Zerto but simpler. Nice explanation, clear and easy. I have a question. I have a VM which has already a snapshoot from a few weeks ago. If I do the backup of the VM, and then delete that snapshoot, will I be able to still goback to the snapshoot on the Backup VM instance? Thanks very much. What method is better? the vmkfstools o the Poor Mans? I managed to get the vmkfstools working, but have not restored it on another ESXi instance. The challenge I have now is that the clone is super big 20 gigs, so moving this files is a pain. Is there any option to compress so I can move faster and the uncompress on the new instance? A vmkfstools based solution is better because you can backup to thin vmdks. I think the best way is to use an NFS as the backup target so you don't have to copy it around when you need a restore. Of course, this does not work when you are running local storage only.